I finally completed my self portrait for my portfolio for Pratt and SAIC. If you do not already know I applied to art schools for the fall semester of this year. The schools that I applied to are The School of the Art Institute of Chicago, Pratt Institute, and Massachusetts College of Art and Design. I am finally ready to put my goals and dreams into place. I have been waiting for far too long and now it’s my time to succeed. This self portrait is proof that I can succeed in the art world. I put hours and hours of dedication towards this oil painting by teaching myself how to paint with oils and learning about certain techniques that are involved. Although I believe drawing and acrylic painting are no sweat, oil painting is more complex. Let me tell you, it was not easy, but I managed to overcome the obstacles that came while going through the learning experience. I taught myself from books, YouTube, and studied famous oil paintings. The books that I used were, The Oil Painting Course You've Always Wanted by Kathleen Lochen Satiger, The Oil Painter's Bible by Marylin Scott, and The atlas of Human Anatomy for the Artist by Stephen Rogers Peck. Learning from books was challenging because every artist uses his or her own technique. To comprehend each technique and then combine the skills that best suits you is the simplest way to make your own style. My favorite way to learn was observing the old master's paintings. 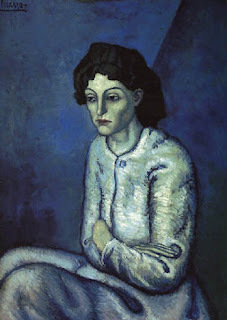 One particular painting that grabbed my eyes was the oil painting titled, Femme aux Bras Croisés (Woman with Folded Arms) by Picasso. I tried to capture the same haunting qualities of this painting. I know that my techniques are nowhere near as good as Picasso, but over all I think I captured a lot of emotion. The Original photograph for my self portrait was taken at a moment of insecurity about the future. I had finished taking a shower and then I received a phone call from someone at TCC. The lady that was on the phone line had told me that I did not qualify for instate tuition, even though I have been living in Florida for over a year. Not only was water dripping down my bare body, but my tears were also streaming down my face. She said there is nothing that she could do. I grabbed my towels, put one on my hair and used the other to cover myself. That was when I lied on the couch with many thoughts about my future. I was contemplating about the options that I had. Since I have graduated from high school several years ago, the art schools want me to take an academic class. I had to pay out of state tuition for the English class and another required class, but since I couldn’t receive instate tuition; I could not afford them both. It was also too late for financial aid. I came to the conclusion that I would have to retake the SAT, so that I would have better chances on getting into the art schools. Since that occurrence, I have taken the SAT and I am waiting for the results. Even though I ran into minor setbacks, I am not going let anything stop me from pursuing my dreams. I know that it took several years after high school to follow my dreams, but it is never too late. Yeah it's never too late. I liked your work, especially "Drowning in the Storm", it's haunting! Keep it up and good luck with school.